For those most interested in the seeming hesitance for black voters, particularly, to resist voting for the Republican Party, one of the most interesting thoughts is if a black candidate outside the Democratic Party ran. I was asked one question after my TURF presentation and defense of this thesis project and that was just it. Do you think a black Republican candidate could sway black voters towards the GOP? I have written on the dilemma of black hesitance to go Republican here before. It is a lot trickier than we often think. Philadelphia has never seen a black candidate run for a citywide office without the “D” after his name, so I answered the question using the most recent, most local example. In 2006, Ed Rendell ran for a second term as Pennsylvania’s Governor. Rendell is a Philadelphia cat in a state that has its issues with its largest city. So, he was unquestionably vulnerable. The commonwealth’s GOP thought it had the perfect candidate to run against a populist Democrat in a largely conservative state, a big name, socially rightist black. Lynn Swann, a former wide receiver for the Pittsburgh Steelers, was one of three black men running gubernatorial campaigns as Republicans. It was part of an initiative by then-GOP Chairman Ken Mehlman to court black voters, particularly those who would identify with the party’s Christian foundation and socially conservative platform. That platform came on the heels of the 2004 presidential election during which George W. Bush got 11 percent of the black vote, compared with 9 percent in 2000. But, it didn’t work out, exactly. Rendell was pulling nearly nine out of 10 black voters in Philadelphia, according to a Philadelphia Tribune/Ron Lester & Associates poll from Nov. 3, which might speak volumes to how Rendell thundered over Swann by 20 percentage points. 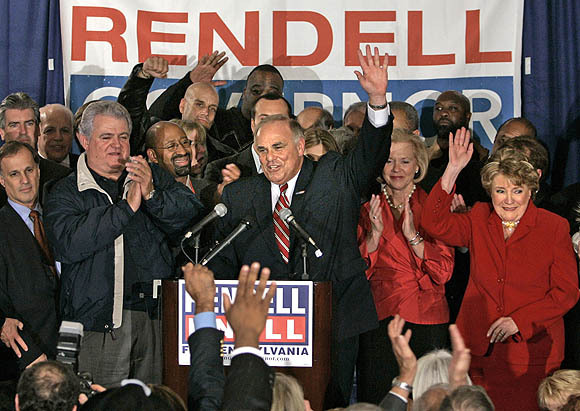 Hear highlights of Rendell’s victory speech back from November 2006, as recorded and edited by the Pittsburgh Post-Gazette. Former Ohio Secretary of State Kenneth Blackwell was another highly touted black Republican who ended up losing. Blackwell, like Swann faced stark challenges. Whites of both major parties are less likely to vote for their parties’ candidate if he or she is black, according to a report by National Public Radio from July 2006. More troubling, and perhaps more damaging to Swann, is that whites who identify themselves as politically independent are more likely to vote for a white Democrat than a black Republican, as Rendell and Swann may have learned. Both black and white voter turnout increases up to three percentage points with every black Democratic Party candidate on the ballot, though it doesn’t increase statistically when the candidate is a black Republican, according to the Quarterly Journal of Economics, as cited by NPR. Again, as I’ve posted before, racial politics have to be different in a Philadelphia election than even a state-wide battle. Though Rendell’s polling data among black Philadelphians seem to cater to the notion that blacks are thoroughly loyal to the Democratic Party and that the machine so deviously strong, Rendell is an unusually popular figure in the city, which may inaccurately characterize the situation. Still, Philadelphia’s Republican City Committee has courted black candidates before, so, while anything might be worth shaking up the current status of general elections, it is important to keep this in mind. Photo by Carolyn Kaster of the Associated Press from November 2006 Rendell victory speech, courtesy of the Pittsburgh Post-Gazette. This entry was posted in Political History and tagged Ed Rendell, Republican City Committee, Topic. Bookmark the permalink.